On April 14, 2017, Foreign Minister Wang Yi and Minister for Foreign Affairs and International Development Jean-Marc Ayrault of France jointly met the press after holding talks. In response to the questions about China's view on the current Korean Peninsula situation, Wang Yi expressed that recently, there has been heightened tension between the US, the Republic of Korea and the Democratic People's Republic of Korea, which indicates a possible war. The precarious situation deserves our high attention and alert. 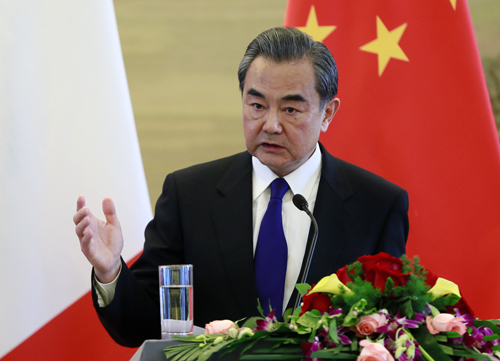 Wang Yi expressed that China has always firmly opposed any rhetoric or actions that could escalate tension. Historically, force is never a solution, and dialogue has proved to be the only way out. On the Korean Peninsula issue, it is not the one who espouses hasher rhetoric or raises a bigger fist will win. Once the war indeed breaks out, the end will only be multi-lose, and no one can be a winner. Therefore, we appeal to all parties refrain from inflammatory or threatening statements and deeds to prevent the situation from becoming irreversible. Whoever intends to start war and turmoil in the Korean Peninsula must shoulder the historical responsibility and pay for it. Wang Yi stressed that the Chinese people often say that where there is danger, there is opportunity. On the occasion of the escalating tension on the Korean Peninsula, we also notice that some rational voices, including the restart of dialogues and negotiations, are beginning to resume, which is just the opportunity we strived for and should be grasped. China has put forward dual-track approach as well as the suspension-for-suspension proposal as the first step to initiate the dialogue. China is willing to further refine them and come out with operable and specific plans. China stands ready to accept salutary suggestions from various parties with an open mind as well. Ways to resume talks can also be flexible. China is willing to support any dialogue, formal or informal, single-track or dual-track, bilateral, trilateral or quadrilateral.